The beautiful colors used in our decorative Autumn Romance Scarf make it the perfect accent for any jacket or autumn outfit. 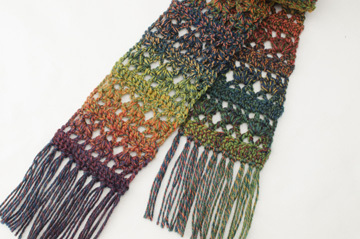 Made with one skein of Patons Kroy Socks FX yarn, it’s a quick and beautiful project for gift-giving! Note: Photographed model made with Patons Kroy Socks FX in #57242 Clover Colors.